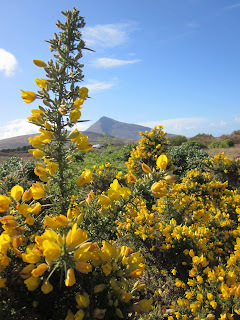 I have been on Achill Island, the largest island in Ireland (an island nation all of its own), for the past 3 weeks now. The hostel had been nearly empty on most nights with the pub supporting the few locals who decorate the bar every evening. This past weekend was Easter and we saw more people trickle in to this sleepy farming community. The music sessions around the peat fire, many pints of Guinness and endless chatter brought life back to the Valley House. For the past few weeks, I have really been enjoying the slow life here. I sleep, run along the beaches, read my kindle, blog, cook, walk around the bogs, look at the sheep, listen to the waves crash and talk with my new Slovakian and Spanish friends who are also "working" here with me and interact with the great guests that pass through. I have really appreciated this time to be with myself and in nature. 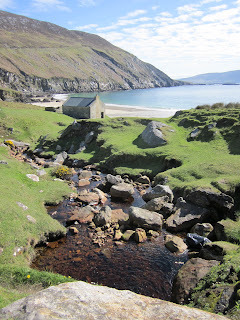 Enjoy photos that capture some of the fun times I've had chilling at Achill Island. Creamy mushroom, bacon and sage over pasta... trying to bring some Italian flare to Ireland! Tuna, sardines on bread- a perfect beach picnic! The best s'more ever! We introduced the "all American" food to the girls. 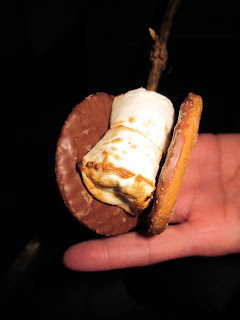 Digestive cookies that have a chocolate coating are the perfect way to make s'mores! 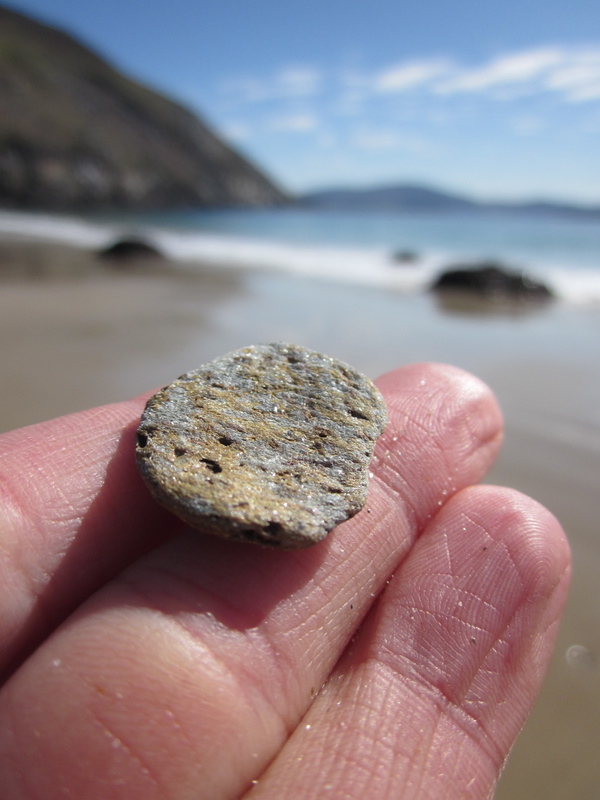 My "rock" memory from this island. I have been collecting stones from my travels all over the world since my first trip to Paris in 1997. I have stones from under the Eiffel Tower, Amazon Jungle, Italian Coast, Galapagos Islands, and now from Achill Island, Ireland. I have loved the 5 mile round trip run to Doogort Beach. 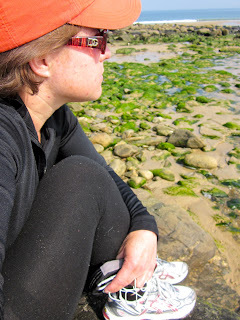 I do it 2-3 times a week and love to sit on this rock and listen to the stream trickle over the rocks while listening to and watching the waves crash in front of me. Love this spot. The weather can change very quickly here. This is a shot of part of my running route home. 10 minutes after I took this photo it was sunny again. Hikes... Cliffs... Waves... Oh my! Measured pours not only ensure consistency and help with inventory but it's also the law! 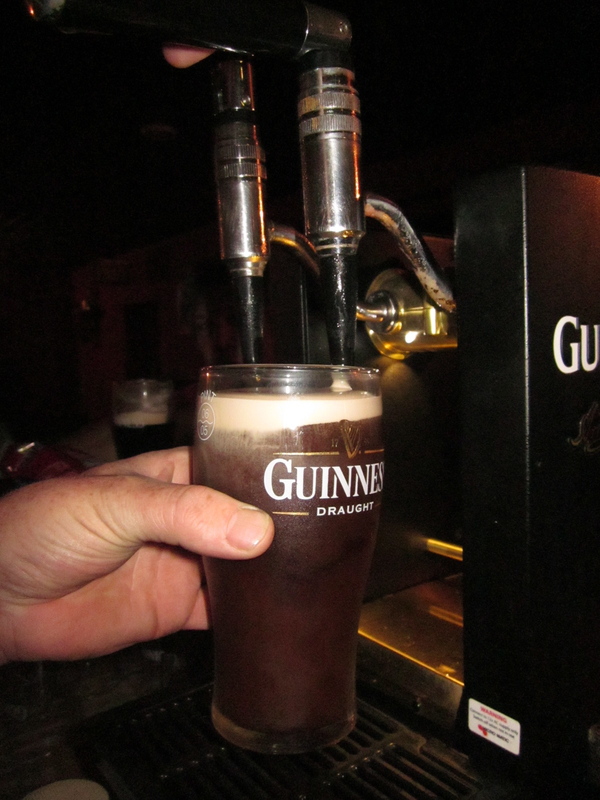 Pouring (or "pulling") a pint of Guinness is an art, a skill and a science. It is one that is highly revered here in the land of rainbows, leprechauns and those who live for this creamy, delicious treat. (And by the way, I've only seen one tiny rainbow and those leprechauns are only to be found in the movies). 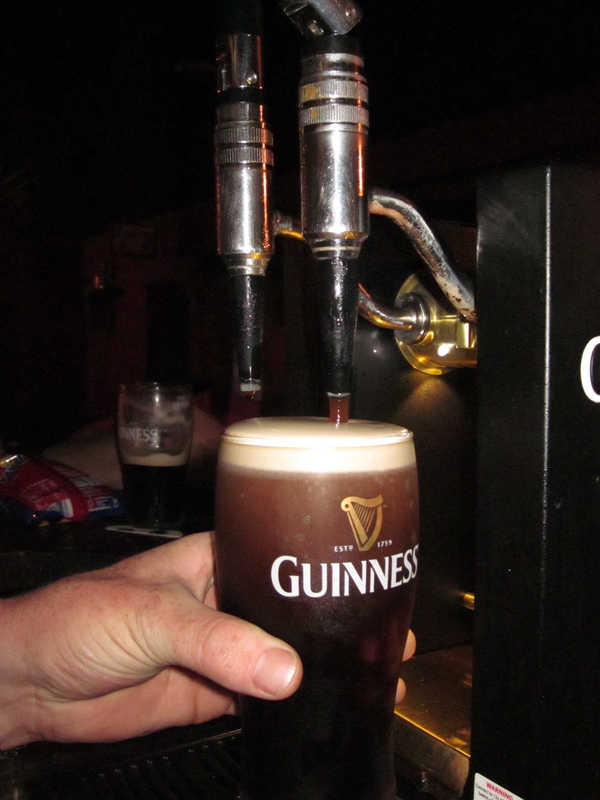 The locals are very particular about who pours their pints. So for me to be pulling their pints after just two days behind the bar, I feel like I have passed the initiation here at the Valley House Pub. I know the "regulars" now and Phillip, Patrick, John, Derrick, and Tony have all been great at welcoming me to their public house (aka "pub" for short). The Dublin boys who come down for the weekend (Paul, Tom, James, Dave, Roddy and Mic) have also been skilled at cracking jokes and having a blast watching me learn the art of pulling pints. As you can see there are no regulars that are female. It's the good ole boys out here on this island folks! 1. Starting with a cool pint glass, tilt the glass so the beer is flowing down the inside of the glass, the spout of the tap can touch the glass. Pulling the tap quickly will allow a "quicker" settling process. 2. Once the beer level is just below the "Guinness" label on the pint, lift the glass to an upright position and finish filling to just above the label. 3. Place the pint on the table and wait until it has settled before beginning the second pour. The photo below shows two glasses with the first and second pours done properly. 4. Bring the glass upright and place the spout of the tap just above the head, pull and pour directly down into the glass, lowering the glass slightly as it fills, always maintaining a few centimeters distance between the beer flowing out and the top of the head. 5. Let it settle. This is when most pints would be served. 6. 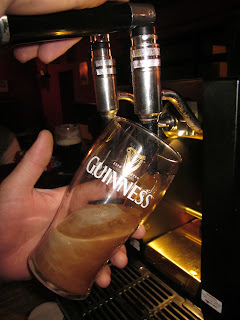 Once settled, bring the glass up to the tap, pull quickly for about a second just to top it off and finish the "look". It's all about the presentation! 7. Serve to a very patient customer who will now enjoy a little slice of beer heaven! 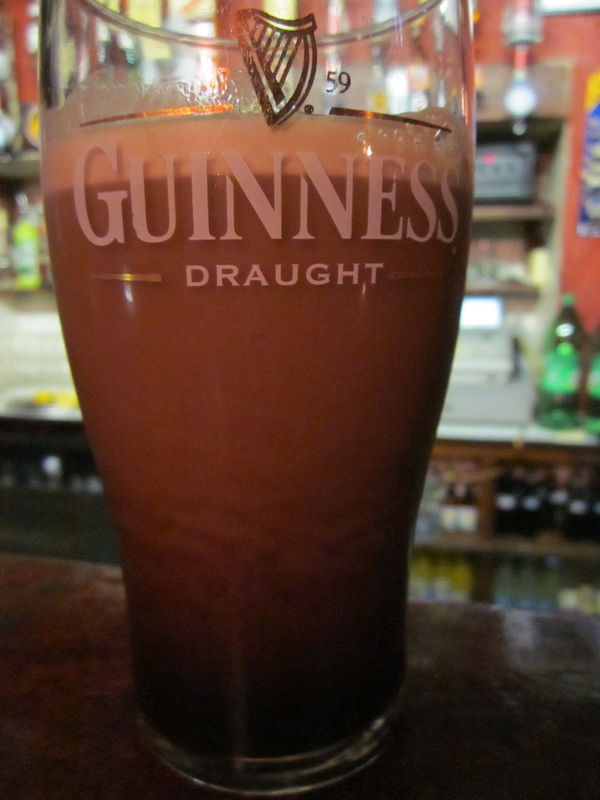 There are a few things in life that should never be rushed, a properly poured pint of Guinness is one of them. It should take between 5-7 minutes to pour a pint. 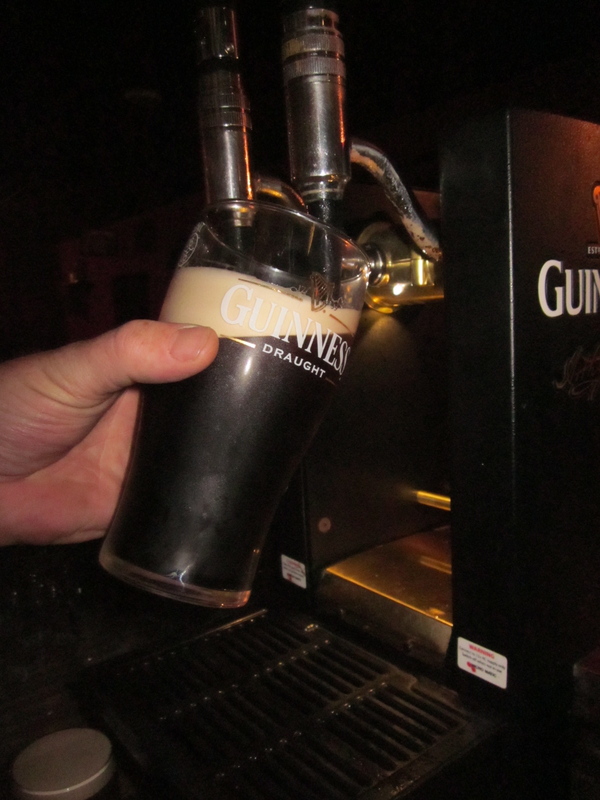 A good Guinness pint will be poured in two pours. Only the best will be poured in three. At the Valley House Pub Guinness is always poured in three pours. The reason for the multiple pours is to allow time for the beer to settle and the creamy head to form. If you rush the settling process the head will not be as creamy or thick and will be too bubbly. 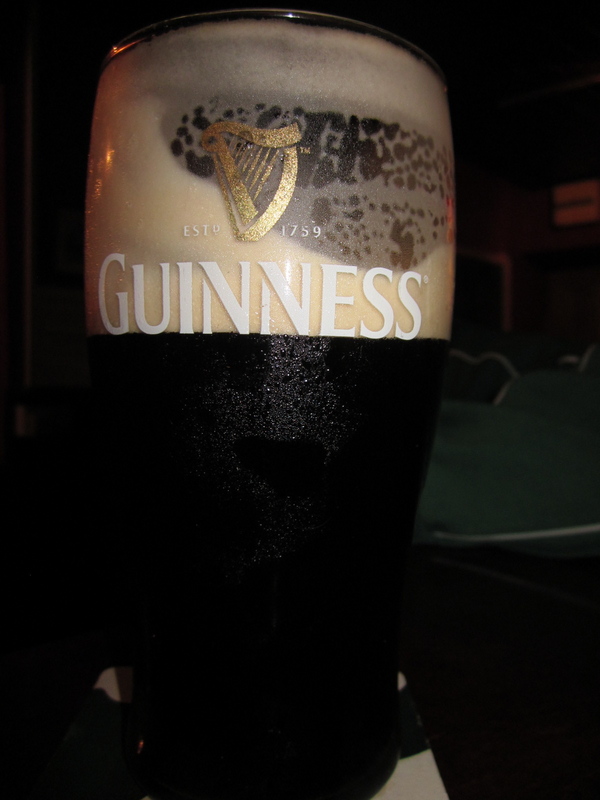 A Guinness should always be served black and clear, never brown and cloudy. The temperature of the glass, the beer, the line and the outside ambient (air) temperature all will effect the clarity of the Guinness and the time it takes for it to settle. The warmer the glass the longer it will take to settle and the bigger the head. Always pour into a cool glass. Guinness beer lines should be cleaned at a minimum of once per month (by the Guinness dealer). Rinsing the lines with water once per week is good for maintenance. 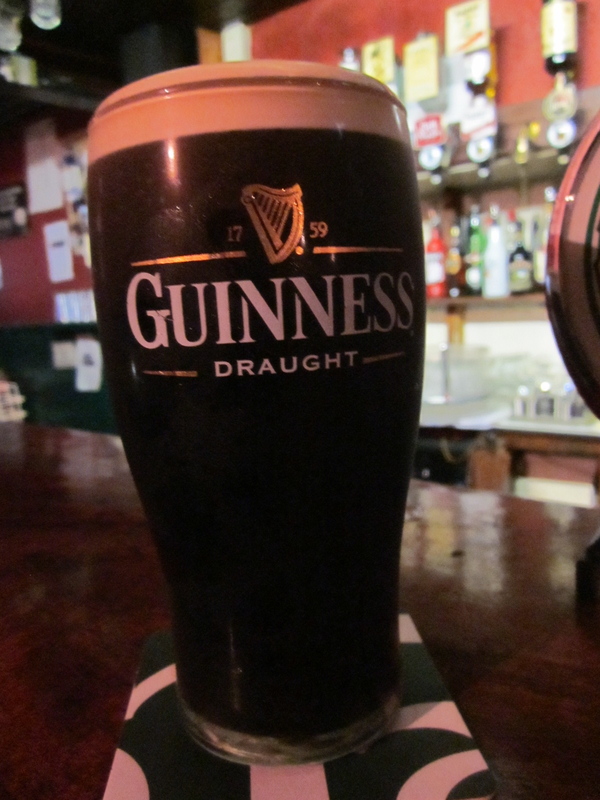 95% of all liquor sales at the Valley House Pub is from Guinness pints. The cost is 3.65 euro (approximately $5.10) for a pint here. 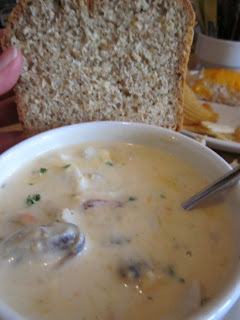 In Dublin it can range from 4-6 euro ($5.60-$8.20). A half-pint size is also available. It is called a "glass". It's all about the presentation! 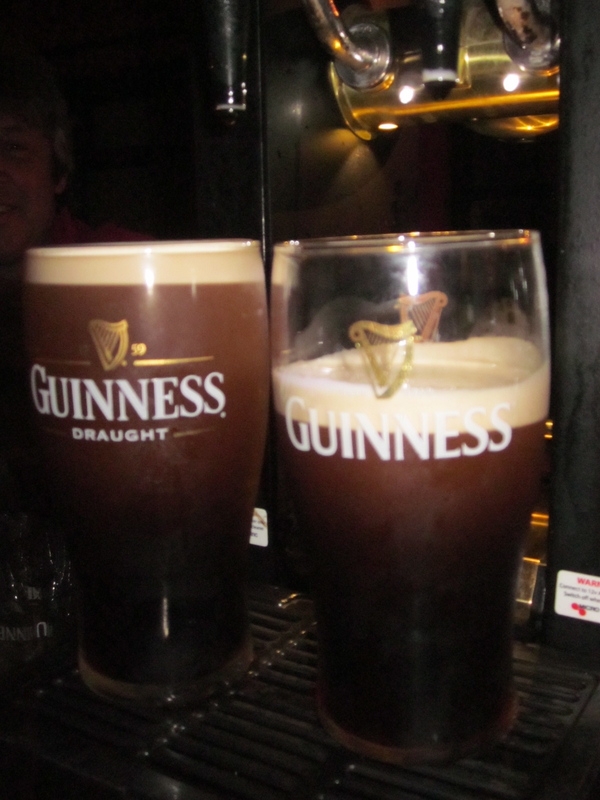 Locals will scoff at a pint that looks less than perfect. If the creamy head has a "cardboard" look, they will not be happy. The head should be slightly lifted above the rim of the glass by about 2cm and not be leaning into itself at all. You can tell a well poured Guinness also by the way the creamy head coats the inside of the glass as it is consumed. The photos below show how a glass should look after the beer is enjoyed. Note the consistent coating. A poorly poured Guinness will leave a clear glass as the bartender did not leave enough time for the head to form or the beer to settle. It is said that the reason why there is "settling time" for Guinness pours is because Arthur Guinness (founder) was pouring a beer at 5:59pm. He stopped to say the Irish Catholic Angelis prayer at 6:00pm (this prayer is said twice a day... at noon and at 6pm). After the prayer was over, he began pouring again. There was a commercial made about this story a few years back. So when you see the "1759" on the Guinness label, it not only refers to the year the beer was established but also to the time 17:59 (5:59pm), when the beer pouring paused for this prayer and thus the settling of Guinness began. Even though we technically speak the same language, I often find myself asking the Irish to slow it down! They speak very quickly (even for me!!) and they use a lot of slang. Last weekend, while working the bar, I was able to hear many new terms and wanted to share a few of my favorites with you here. What's the Craic? = What's up? On the Swish/On the Hooch = Drinking (getting wasted). Example: "Erica was on the swish" = Erica was drinking/getting wasted. 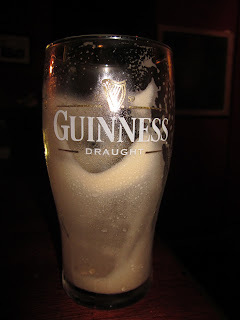 Pint of Smithwick's with a Guinness Head = A pint of Smithwick's beer with a little Guinness added at the end to make a creamy head that looks like a Guinness head. Bulmer's = An alcoholic apple cider, served with a pint glass of ice. Tastes like a light Wood Chuck or Hornsby's. Mi Wadi = A concentrated artificial fruit drink to which you add water. Kids love it. Comes in orange, black currant, and lime. Also yummy to add to vodka. Hot Whiskey/Port = A shot of Irish whiskey (or Port), 4 cloves, a lemon slice and fill the small glass with hot water. Add sugar if desired. Baby Guinness = Tia Marie (or Kahlua) and Bailey's ... looks like a Guinness. Just for the craic, see how many of these Irish terms you can incorporate into your conversations in the next few days! It's the craic! First of all, I've been saving for this trip for the past 2 years. Before leaving, I sold everything I owned, including my car, furniture and anything I could easily replace or wouldn't want in 2 years time. I did keep some of my ski and kitchen gear of course, and I can't wait to come back and prepare the culinary delights I have experienced abroad for all of my friends and family. Don't worry- there will be multiple food extravaganzas in both Florida and Colorado. The most important thing I did was to sign up with a few wonderful volunteer organizations that provide hosts who will offer lodging and food in exchange for work. I stay and eat for free while contributing to their business or home while meeting wonderful people, travel, learn new skills and really be a part of the culture. 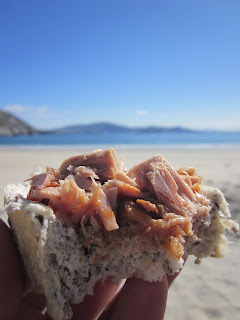 It's great to spend a longer amount of time in a place and really get to know the people, environment and the cuisine. The biggest expense I have is the cost of traveling to the host sites and any side trips I want to take. The WWOOF organization began in the UK in 1971 and is available in countries all over the world. They link volunteers with organic farmers and help people share more sustainable ways of living. In exchange for volunteer help, WWOOF hosts offer food, accommodation and opportunities to learn about organic lifestyles. 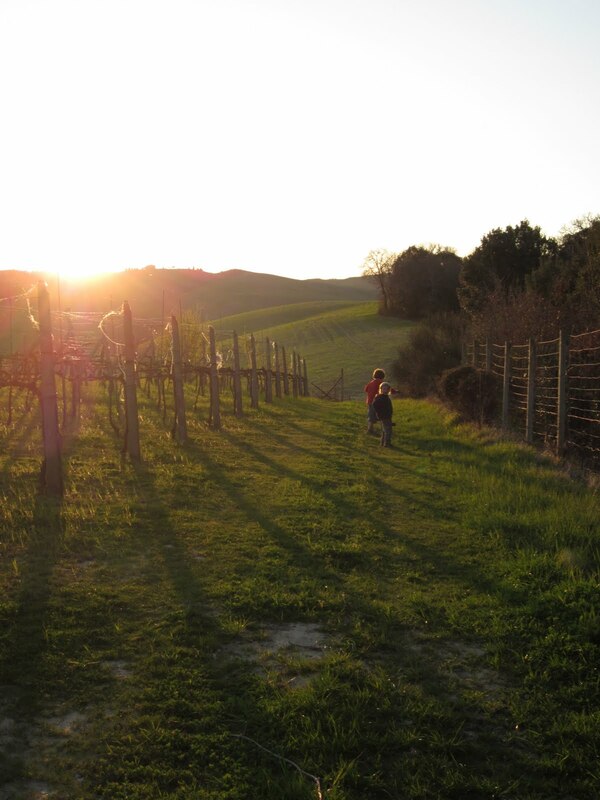 To become a member, you must register with the WWOOF organization for a particular country and pay a small fee (for Italy it was roughly $40) for an annual membership. Once you are a member, you can read about the farms and gain their contact information. The farm information will often tell you about the location, types of food grown and farm activities available, work expected, accommodations, meals, family members, languages spoken, etc. As a WWOOFer you decide which farms you are most interested in and you initiate contact with the host. You make all the arrangements and then show up! The fee also covers a small medical health insurance policy. This is a great way to be involved with food production literally from the dirt up. Talk about the real "farm to the table" experience! I arranged all of my Tuscan farm stays through WWOOF and will be using it again in northern Italy when I return in July. 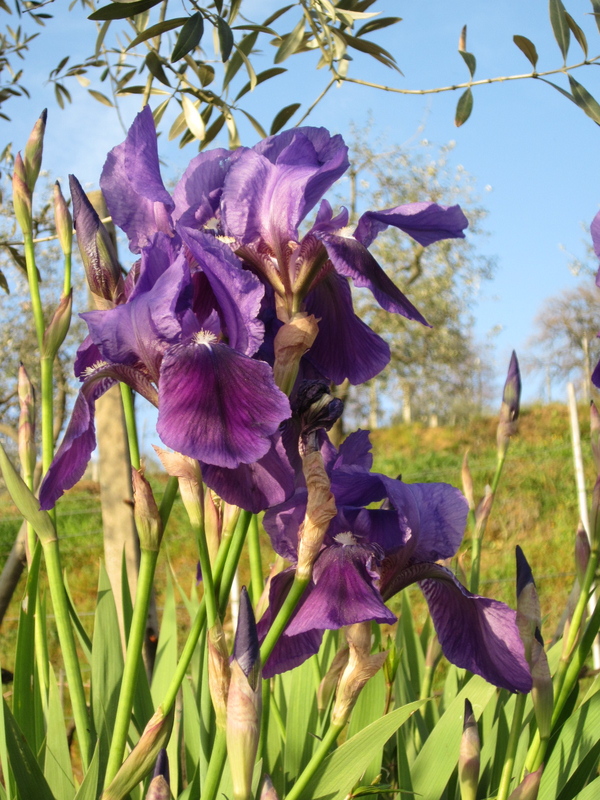 As a WWOOF Italia member, I also have access to the WWOOF Independent country sites, including Croatia, which I will probably use next year. Workaway.info is a site set up to promote fair exchange between budget travelers, language learners or culture seekers and families, individuals or organizations who are looking for help with a range of varied and interesting activities. A few hours of help per day (usually 5 hours per day/ 5 days a week) is expected in exchange for food and accommodation and an opportunity to learn about the local lifestyle and community. This organization is a great way to travel on a budget, learn a language and gain experience in various settings, not just on a farm. Host sites are available around the world and work ranges from housesitting to carpentry to gardening to child care to hospitality and tourism. For a small fee (roughly $20) you have a membership for 2 years and are able to contact hosts and make stay arrangements. Hosts can also search your profile and contact you to ask if you would like to come and join them. I will be working at a Sea Kayaking company on the Beara Peninsula here in Ireland. 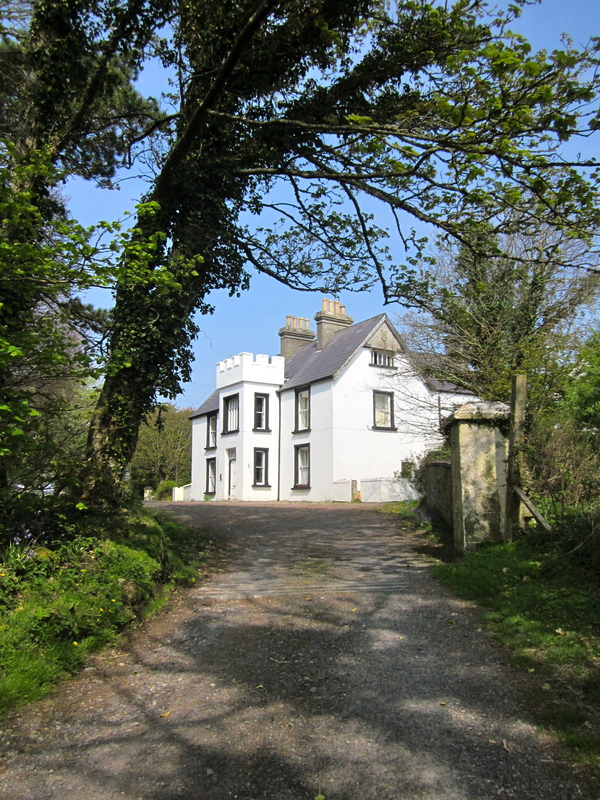 There are many host listings in Ireland and I can also use it in Italy when I return. Very similar to Workaway.info, HelpX is an online listing of host sites including organic farms, non-organic farms, homestays, ranches, lodges, B&Bs, Backpackers hostels and even sailing boats who invite volunteer helpers to stay with them short-term in exchange for food and accommodation. HelpX is provided primarily as a cultural exchange for working holiday makers who would like the opportunity during their travels abroad, to stay with local people and gain practical experience. Typically the helper works an average of 4 hours per day 5-6 days per week. HelpX is very popular in the UK and Ireland, though it is available around the world. A $30 membership fee allows one year of access to host sites. Although it is most common for a helper to contact hosts to make arrangements, like Workaway, hosts can also view a helpers profile and can contact the helper if interested. I have arranged most of my Ireland host sites through the HelpX site. 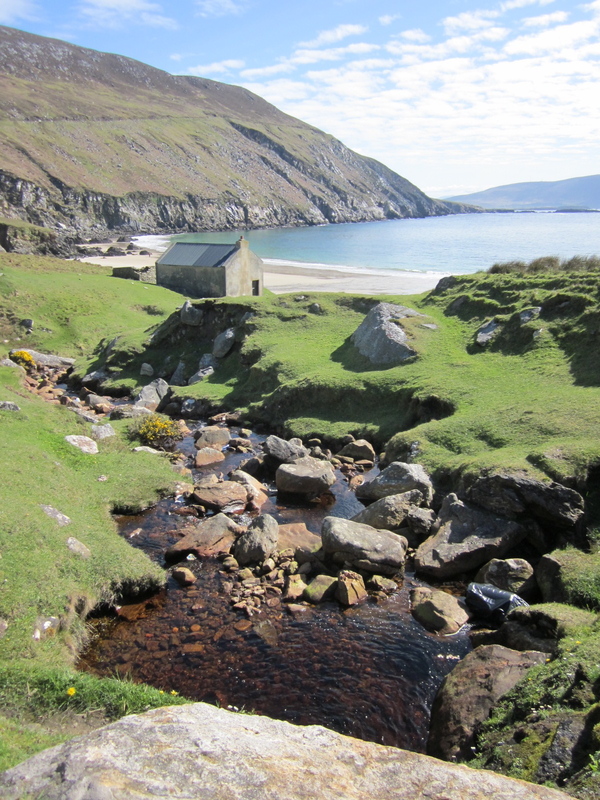 Currently I am at the Valley House Hostel in Achill Island with 3 other HelpXer's. I will also be going to a coffee shop/catering company and organic cafe in the next 2 months. I might use this organization in Italy to gain more hospitality experience and can also use it in Croatia or other countries. CouchSurfing is an international non-profit network that connects travelers with locals in over 230 countries around the world. It is intended to bring people together for cultural exchange, friendship, hospitality and learning experiences. Their mission is to create inspiring experiences via homestays (staying with a local as a guest in their home), as well as other activities and social networking. CouchSurfing is free to join, though you can make a donation. All you need to do is create a profile and start to contact people to inquire for stays. CouchSurfing is not intended to be just a "free bed"; it is meant to be a way to experience cultural exchange, meet new people and learn new things. CouchSurfing members share hospitality with one another. 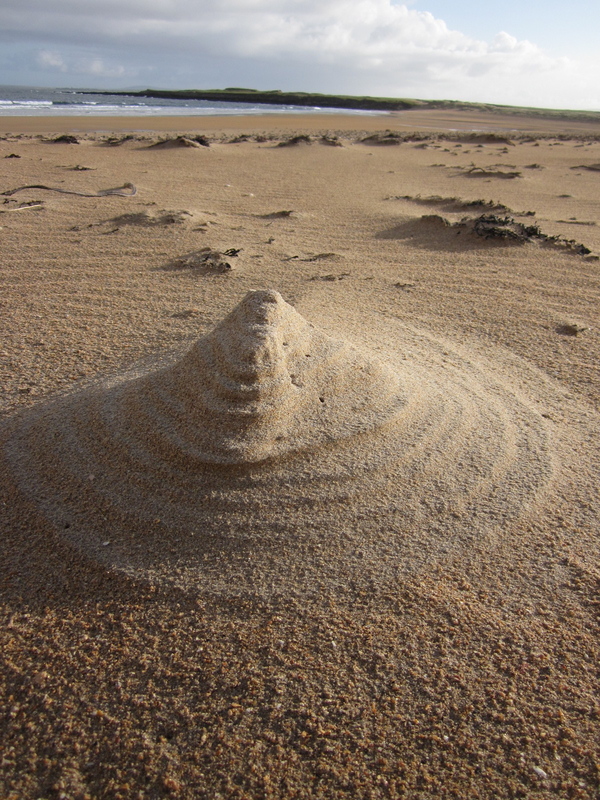 Hosts have the opportunity to meet people from all over the world without leaving home and "surfers" are able to particulate in the local life of the places they visit. CouchSurfing is often a short stay and not arranged far in advance. I have only signed up and created my profile. 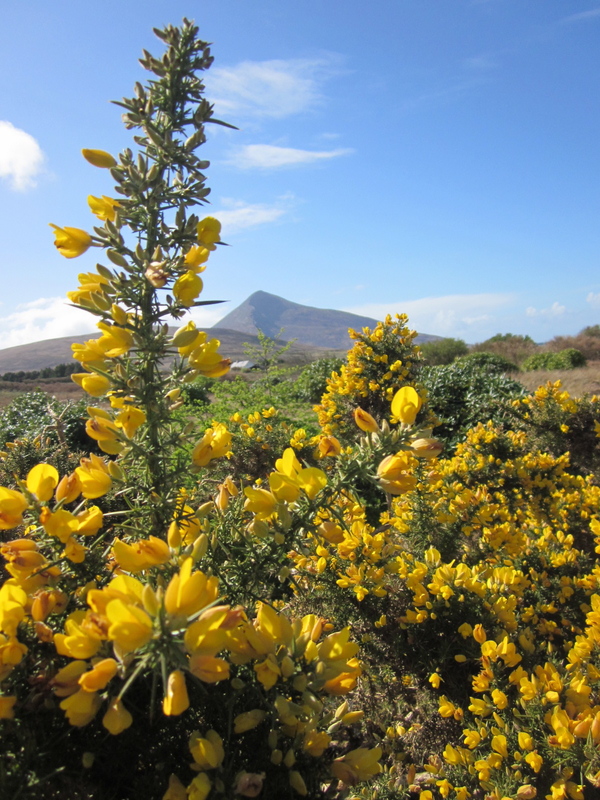 I hope to CouchSurf in Dublin for a few nights and perhaps in Italy to experience some areas outside of the farms I will stay at. I have talked to other people who have "surfed" and have had a wonderful experience and highly recommend it. I hope these sites have given you some information on how you too can travel on a budget and experience different areas of the world not just as a tourist but more as a local. I have even thought of using these organizations in the US and Canada in order to experience areas of the country that I might otherwise not be able to afford. Once you start to travel like this, it is all you think about! 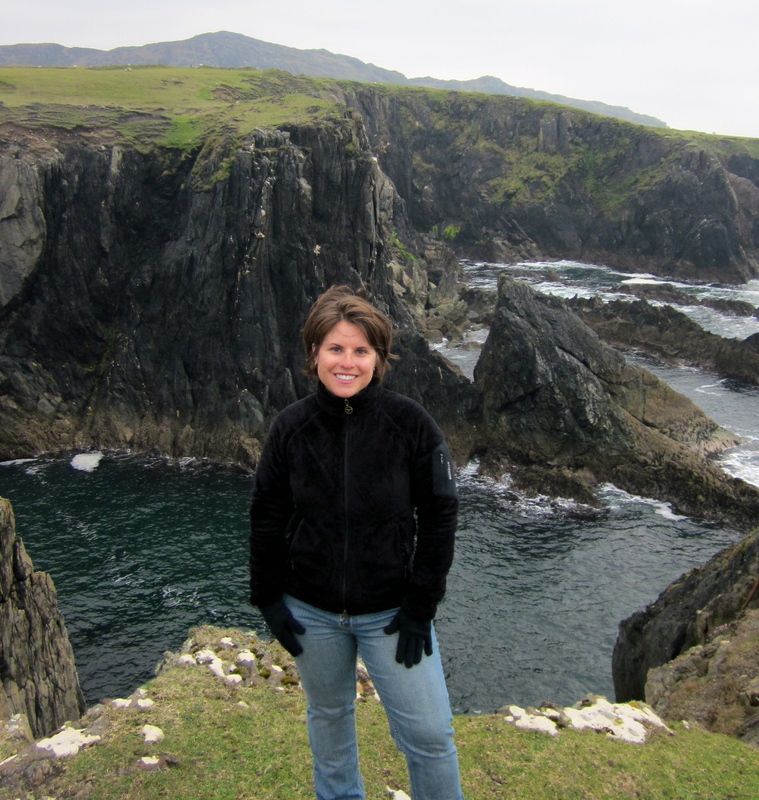 The "travel bug" bit me at a very young age and I have always made it a priority to figure out how to keep going. I hope you get a little "travel itch" from this information as well... GO FOR IT! My beautiful Italy. 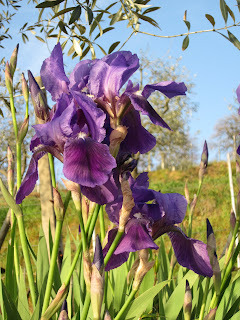 The first three months of 2011 (the “first quarter”, as those in the professional world may call it) was a delicious, educational and active adventure. I loved my time in Italy! 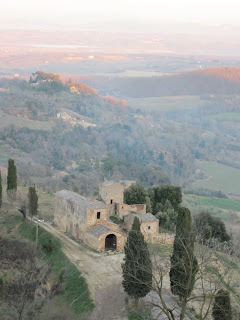 I learned about the culture, cibo (food), vino, formaggio, farming practices (growing and sales), language, transportation, moda (style), and about myself. 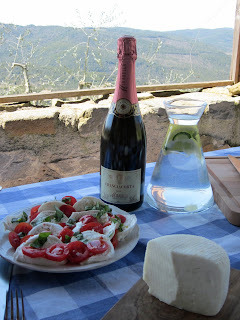 Although it was not always easy, I managed to visit all the places I had set out to see, eat all the foods I wanted to try and drink all the wine I could imagine. Mission accomplished … and in addition, many surprises along the way. Before leaving Colorado, I wrote notes to everyone who touched my life there and I also received some in return. I have them with me and read them every time I move to a new location or begin a new journey. They remind me of where I come from, who I am, and give me the strength to keep going beyond why I am here. One friend wrote that they wish for this adventure to be all that I hoped for and more than I could ever imagine. That it is. It is more than I could have ever imagined in so many ways. I have learned that you can try, but you can’t plan life. The plan changes, the rules change, and life is full of surprises. Some pleasant and others not so much. But all have a purpose. And I think when we sit back and are able to see them for what they are, we can learn and appreciate each and every one of them. Below are my current thoughts and feelings about my first three months in this beautiful country. I am glad that I will be fortunate enough to come back in 90 days to experience even more of this land and myself. Patience. Being patient with yourself and the world is the key to unlocking the treasures within. I found that the times when I forced myself to be the most patient with myself, people, and situations were the times when I was most surprised at the beauty that flourished. There were times when I wanted to rush to the end or try to plan everything (as is typical for me). But when I would allow for people to just "be" (including myself), I ended up enjoying the result so much more. It all works out in some way if you just let it be. 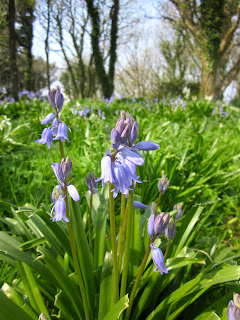 One of my fellow WWOOFers poetically said "the only road to where I am now is the path I have taken". And although very straight forward, it means a lot to me. Passion and Respect. Italians are known for their passion - for love, family, food, soccer, and life. It is true. They are a passionate bunch. They love to speak loudly, use exaggerated gestures and are passionate about time with their family. The way they grow, select and prepare food also shows their passion and their respect for the earth and what they consume. Eating "in season" is the only option. Drinking great wine is a part of everyday life. It is the sauce for food, elevating it to another level ... it is not meant to get you sauced. Like Italians, I too am passionate. Passionate about food, travel, vino, cheese and my relationships. I cherish and respect the wonderful people who make my life what it is. Living here has just shown me a deeper, more integrated passion in life. Beauty. Italians are a work of art. Literally. They place a high value on their appearance and their style, accessories and quality of fabric reflect this commitment to being beautiful. Scarves are a requirement for both men & women for every outfit and all seasons, regardless of temperature. The land is also just as beautiful … accessorized with rows of vineyards acting as necklaces surrounding restored stone villas and rolling hills gently blanketed with a soft pink hue at sunset. Presentation is everything to an Italian. Whether you are presenting a roll of toilet paper or a beautiful meal, all items will be presented using quality materials and stylish serving pieces or beautiful wrapping. I have loved being surrounded by this beauty and hope to bring a sense of it back with me to the states one day. I started making a list of the kitchen items I have used here that make life a but more beautiful and delicious- I plan to get them when I create my home again in the future. Life. 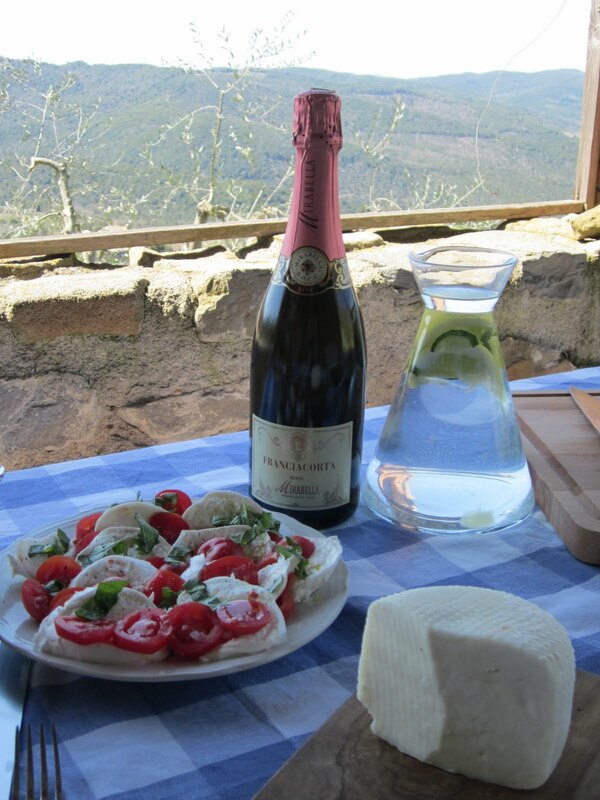 Italians place a high value on life, the enjoyment of the moment and the people in that moment. Although they like to complain about the economy there are many shopkeepers who will close at “random” times because those are their hours they want to keep- they would seemingly rather spend time as they wish than work harder to be open longer to make more potential sales. Yet despite being closed often, they still complain that there is no business. This is my American perspective talking here, but honestly, why should they stay open if there is no business? That time would be better spent with their family. And by doing what is best for their family in terms of balance, they are able to truly capture and create the essence of living la dolce vita (the sweet life). And this is what Italy is all about. It is the unplanned meeting with a friend in the piazza and then the 2 hours they will spend catching up and enjoying a coffee or having an aperitivo before dinner because they want to relax with great company. Why rush? Why push? Slow it down. Enjoy. It will be fine. Frustration. You have to know the system and then how to work it. Italians deal financially in the “black” a lot. You have to know who is partnering and dealing like that and then be ready to play the game too. Things are never as they appear. There is a whole sub-culture to learn and this is not even including the mafia- that is a whole other story! For me, there has been frustration with Italy in terms of my lack of independence, the weight I am choosing to carry, the isolation I have felt, the language barrier and inability to do my favorite thing in life (besides eating) … connect with people. I have made many hard choices to be here and given up a lot of things I love- my home, my stuff, my job, my dog, my friends and family, my routine, my independence, my life. It has been worth it, but it is still hard. A friend said to me "keep your head up so you can see your dream". There were days I needed to remind myself of this. For those of you wondering how I could feel anything less than the most independent person in the world for doing this, I will explain. I am completely dependent on other people for every aspect of my life right now- for food, transportation, shelter, access to communication, etc. I twas my choice to do it this way, but it is still hard. I now let others take care of me and this is a very strange feeling because I am always in the care-taker role and I enjoy it. So to be in the other seat has been an adjustment, but an enlightening one. By being here I have learned how to take care of people even better and understand their needs in different ways. Because I couldn’t converse as easily in Italian, I couldn’t be social with anyone who looked interesting. Conversations were very basic and limited in public, and full of exaggerated gestures. My brain is also exhausted! Every conversation has me sitting on the edge of my seat, hanging on every word that is spoken, trying to translate and make sense of this language. At the same time, it has been good for me to be quiet, to observe and to just take it all in. I have relied on public transportation and needed to plan far in advance for making connections, etc. Life is not easy without a car in rural areas. At the same time, those who have befriended me are very special people. I never expected to have such wonderful friends again so quickly. I did not anticipate experiencing the same sad feelings of leaving friends and family again so soon, but I’m glad I am. It means I connected and it’s not arrividerci (goodbye) … it’s a presto (see you soon). Change. The rules change. People are human. Life is full of moving uncontrollable parts. I used to get flustered with change and not like it. Now, I am better able to handle it. I can accept it, and move on. I still process it but I don’t get as stuck on it. During these past three months I have felt anxious and worried about various things. Everything has worked out- it will always work out, in some way… the way may not be what you imagined, but it is what it is. Change forces us to trust. Trust ourselves and our surroundings. I have placed trust in many people in this foreign country and have been the recipient of many great surprises and some that caused me to make my own changes. But I have learned from each of them. Silence. I have learned that I need quiet time. And not the time I am sitting with others and not speaking. It is the truly quiet time I have with myself- to listen to my own thoughts, or to be blank with my mind. Time to just "be". 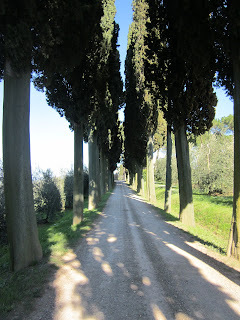 I enjoyed many hours of silence with myself in the campo in Siena -- while the world whirred around me, tourists on tours, students meeting for gelato, moms running after toddlers, etc… I sat there in my own silence and loved every still minute. I need to make time in my life to have this every so often. It is rejuvenating. I often got this while running, swimming or hiking in Colorado but here in Italy, it is just sitting. 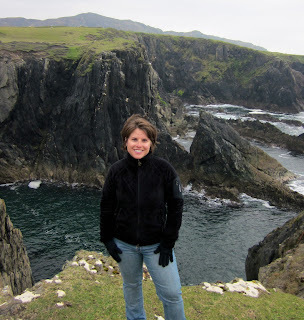 So off I go to Ireland where perhaps "just sitting" will look completely different. Who knows. The adventure continues and this time I have no expectations. I literally know nothing about this country (and it is one that I actually come from). So anything that happens here will be a great surprise. Unlike Italy, I am prepared for nothing and ready for anything. And to me that is the best adventure.